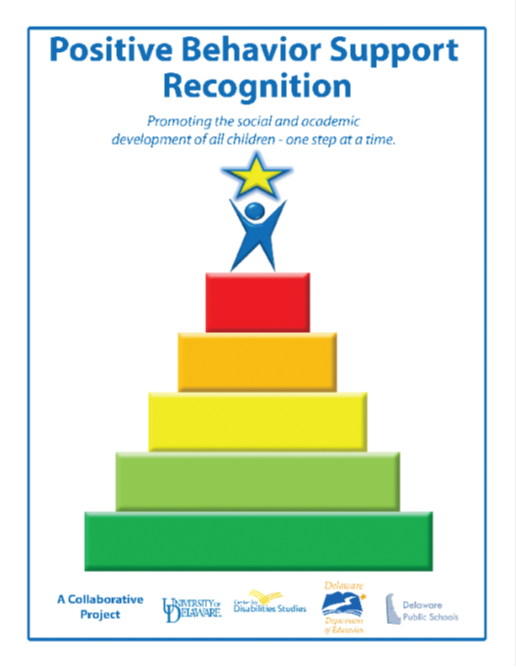 The Delaware Positive Behavior Support Project (DE-PBS) offers annual recognition to schools that exemplify specific components of the DE-PBS Key Features. For the 2015-2016 School year, the Delaware PBS project recognized 26 schools at Phases 1, 2, 3, and 4 of School-wide Positive Behavior Support (SWPBS) program implementation. Schools at Phase 1 have a strong foundation with many of the key program components in place. Schools at Phase 2 have all of the foundation pieces in place, but must also show how they have systems in place to sustain their program and include an emphasis on promoting social-emotional learning and developing self-discipline. At Phase 3, schools also demonstrate effective systems for supporting at-risk students, such as utilization of a problem-solving team and targeted, group-based interventions for students. Schools that have previously received Phase 3 recognition may then apply for Phase 4. At Phase 4, schools must demonstrate the presence Tier 2 systems with data on overall intervention effectiveness. At all phases, demonstrating how their SWPBS team uses data for planning is critical. To achieve Phase 1 recognition, schools had to report that the required elements of a Positive Behavior Support program were in place during the 2015-2016 school year. These elements include a representative School-wide PBS team which meets monthly, positively stated expectations of behavior, strategies for teaching these expectations, a system to positively acknowledge students, and collaborating with families by both informing them about the program as well as providing opportunities for families to share feedback and ideas. In addition, teams had to submit documentation of how the school defined behaviors managed in the classroom versus those referred to the office; administer a Needs Assessment or School Climate survey to the staff; and answer a reflection question about their program and plans for improvement. To achieve Phase 2 recognition, schools had to report all of the above elements of a Positive Behavior Support program were in place during the 2015-2016 school year but also demonstrate additional elements that focus on sustainability and supporting students to develop self-discipline. Requirements included a description of procedures to correct problem behaviors, instruction of problem solving strategies to help prevent future problems, and dissemination of important information about SWPBS to all staff. Additional elements included a system for orienting new students, staff and substitutes to the program, staff completion of at least one section of the Needs Assessment, and the team response to two reflection questions.